I’d been thinking about making an authentic New York Style Crumb Cake for quite sometime. What prompted me to go ahead and actually do it was the current issue of Cooks Illustrated which has an article about how to make it right. At first glance, the recipe looks pretty typical. However, CI’s is the only one I’ve seen that instructs how to make a really authentic crumb topping – the type with bigger, “doughier” chunks which are very different than your typical crumbly streusel. 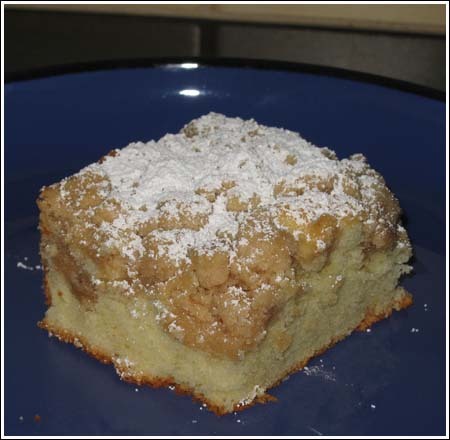 A few other bloggers posted Cook’s Illustrated New York Style Crumb Cake and were asked to take it down. Given this, I’ve linked to CI’s website. They offer a free 14 day trial, but you’ll probably get hooked! Update: You can find it pretty easily on-line with a Google search now. Here’s a good paraphrased version with lots of photos. I made some changes, which is why my cake looks a bit different than CI’s. CI used dark brown sugar in the topping. I only had light, therefore my topping is a bit pale and anemic. Definitely use the dark. I used Bulgarian yogurt instead of buttermilk. The texture of the cake was phenomenal — very soft and tender. CI’s method of mixing the butter with the flour (similar to many British and French cake techniques) results in a much softer, more tender cake — just don’t be tempted to use all-purpose flour or your cake will be tough. I just made this crumb cake. Oh my gosh, it is fabulous! I really love all of your recipes. Thank you so much. Sorry the crumbs took over. I know you said you followed the recipe to the letter, but could you have used a 9 inch pan rather than an 8 inch? That’s the only thing I can think of that would have caused the cake part to be too thin. Then again, it is supposed to be kind of thin. I do remember this cake having a high proportion of crumb topping. I made this recipe on Saturday but somehow the cake swallowed all the crumbs! I’m not sure what happened but I had followed this recipe to the letter. I am thinking maybe I need to make more of the crumbs? Any idea’s? I watched the Cooks Illustrasted pod cast. Then I was off to make the cake. I took it to a work holiday lunch. Work people enjoyed it, but they will eat anything. My favorite compliment was the woman who mentioned it tasted just like Entenmann’s. Thanks for the encouragement! I never would have tried this if I hadn’t watched the podcast. I made this this morning and it is one beautiful cake. Like you I used light brown sugar but I used European butter. Lauren, sorry you have to work on Sunday. I am glad you like the banana cake. Debbi, I’d buy some cake flour for this one. Cake flour has less protein which means it will form less gluten when beaten. Gluten, a matrix of proteins, make cakes/breads chewier/tougher. Now cornstarch doesn’t have protein, so using the cornstarch trick would reduced the overall protein count and the trick MIGHT help. However, I would first try it with cake flour. The texture was so wonderful. Randi, does that mean you have lunch with Christopher Kimball on a regular basis 😉 ? I tested this recipe before it was published, I’m a friends of cook’s. LOL. We’re making this recipe at work for Mothers day brunch. It calls for cake flour. In a previous post, you gave the recipe for adding cornstarch to all purpose to make cake flour. Would that work here??? or do you still recommend cake flour? Mmmm … that looks so good. I’m sitting at my desk at work (yes, I work Sundays, boooooo. Silly Law students, they don’t need their library open on Sundays!) and my stomach is already growling but it’s not my lunch yet and for some reason I didn’t bring myself enough snacks today. I did bring my version of your banana cake (only difference being that I threw coconut in it) to share with my coworkers, but I’ve already eaten two pieces and I’m still hungry!